This Crazy Bonez cat ran out of its nine lives a long time ago! Life size cat skeleton. Bone colored. Measures 18'' long by 10'' high. This cat of bones is amazing. It is made of a durable all weather material that will survive my graveyard setting for years to come. Thanks for the innovative products! 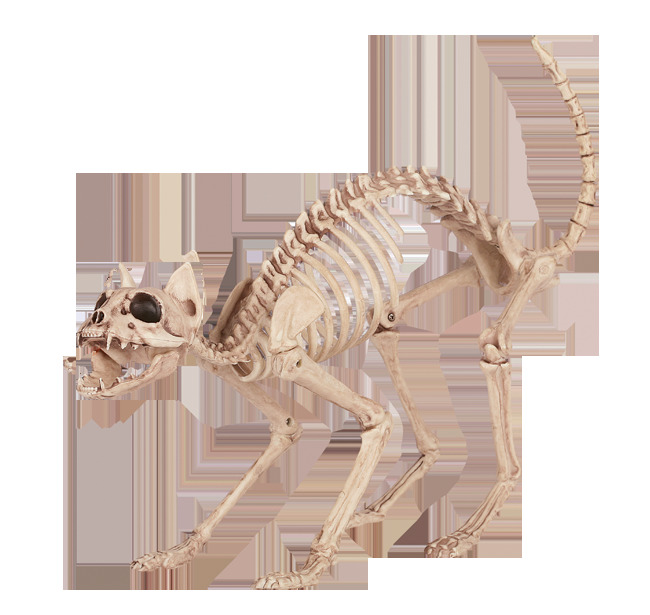 My skeleton family aren't dog people and really wanted a pet so I have been hoping for a skeleton cat. I wish it had more articulation, but it looks great. The tail is poseable and the head twists. Yes it has bone ears, but without them it would just be an unrecognizable small animal skeleton to most people. The dog skeletons have ears too. I think this little kitty is so cute! I'm thinking of adding a bow around the neck. Good quality and would be useful in many different halloween themes. I'm displaying the kitty inside for the moment but it will be used in a deranged doctor lab scene in halloween but would be good decor for just about anything. It was too cute to resist buying and I'm soooo glad I did.